FACT CHECK: Did 449,000 Californians Turn Down Jury Duty Because They Are Undocumented Immigrants? Did 449,000 Californians Turn Down Jury Duty Because They Are Undocumented Immigrants? Facebook users spread an unscourced and uncorroborated anti-immigrant statement. 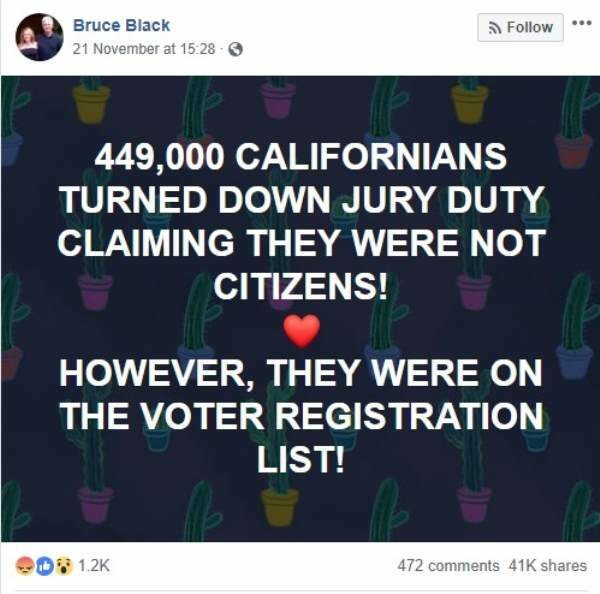 449,000 California residents turned down jury duty because they are not U.S. citizens, despite being registered to vote. According to the Superior Court of California for San Diego County, the large majority of courts in the state use Department of Motor Vehicle records as the primary (meaning “the number one”) source for prospective jurors, although registrar of voter data is also used as a secondary source. Undocumented immigrants have been eligible for drivers’ licenses in California since January 2015, when Assembly Bill 60 took effect. 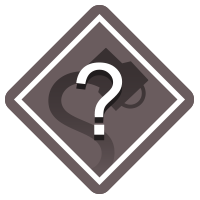 As of April 2018, the bill had enabled more than 1 million motorists to receive licenses upon providing proof of identity and residency in the country. However, they are ineligible for jury duty and cannot register to vote in U.S. elections. While each of the 58 counties in California has a superior court, not all of them record how many potential jurors are excused due to being non-citizens. Los Angeles Superior Court, for example, excused a total of 208,149 jurors in fiscal year 2017-2018. By comparison, Contra Costa County Superior Court in Northern California issued 14,522 excuses from jury duty between 1 January 2017 and 30 November 2018. In San Diego County, the state’s second-largest court, 32,290 people were specifically removed from the juror pool between 1 January 2018 and 11 December 2018 for not being U.S. citizens. But that figure represented just 29 percent of the 109,548 total people disqualified from the jury pool during that period, casting doubt on the graphic’s suggestion that nearly half a million people statewide were both registered to vote (the kind of “voter fraud” claim that has been consistently debunked) and contacted regarding jury duty. Los Angeles Times. 5 April 2018.